Introduction: Lichtenstein technique of inguinal hernia repair, which is performed with tension-free approach by mesh placing and fixation to the surrounding tissues, is currently the treatment of choice for open surgery repair of inguinal hernia. The fixation of the mesh is estimated to be the cause of post-operative complications such as chronic pain, surgical site granuloma, nerve entrapment and hernia recurrence. 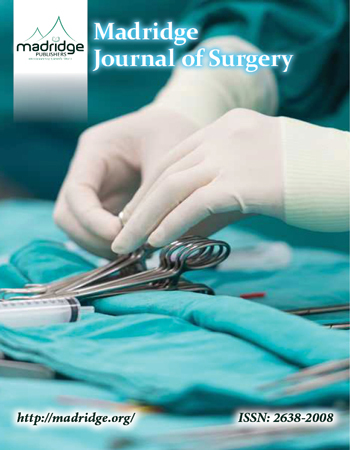 Aim: The aim of this research is to retrospectively determine the efficacy and the clinical implications underlying the use of self-adhesive mesh compared to a non-adhesive mesh in open surgery repair of inguinal hernia. Methods: This study is a retrospective study that included 248 Patients. These patients underwent open surgery repair for inguinal hernia with Liechtenstein technique at Assuta Hospital, Israel, by using a Progrip adhesive mesh (by Covidien), while fixation was made only with a few Vicryl sutures (2 - 3 stitches only).The Patients were requested to scale pain intensity by using Numerical Rating Scale (NRS) method. For post-operative Clinical evaluation, participants were questioned for periods of one month, three months and six months after surgery while carefully identifying post-operative complications that included chronic pain, surgical wound granuloma, seroma, nerve entrapment and hernia recurrence. Results: The average pain intensity was 3.16 (± 2.3) after one month, 1.14 (± 1.6) after 3 months and 0.43 (± 1.2) after 6 months of surgery. Four patients (2.7%) reported pain intensity over grade 3 on the NRS scale during six months after surgeryand only six patients (4%) reported pain or any discomfort after two years of surgery while the NRS scale was less than 3 during this time. Sixteen patients reported chronic complaints and two patients (0.8%) reported hernia recurrence that led to a second surgery. Conclusion: In conclusion, the use of an adhesive mesh compared to a non-adhesive mesh reduces chronic pain complaints and reduces its severity. In addition, this surgical approach leads to a fewer common post-surgical complications. Nevertheless, there was no change in the incidence of hernia recurrence compared to a non-adhesive mesh. Keywords: Inguinal hernia; Lichtenstein technique; Mesh fixation; Chronic pain. Hernia is defined as "the protrusion of content through its surrounding walls". Among the most common encountered in general surgery are inguinal hernias. Historically the accepted technique for a hernia repair was the "primary repair" that relied on primary repair of tissues with non-absorbable sutures while rebuilding anenforcementthe inguinal floor (bassini approach) . A revolution in hernia surgery started with the introduction of the tension free repair (Liechtenstein repair) that relied on mesh fixation between the inguinal ligament and the conjoined tendon thus building the inguinal floor to decrease the tension exerted on the already weakened and failed tissues of the inguinal canal. Good fixation of the mesh is vital to prevent displacement, which reduces the rate of the hernia recurrence . On the other hand the quality of mesh fixation is suggested to cause the post-operative complications like chronic pain , wound granulom as and nerve entrapment [6, 7]. These complications are believed to happen because of micro trauma to tissues exerted by sutures aiming to better fixation of the mesh to its place. The general features of the underlying mesh such as weight and size of the material which forms the mesh, according to many studies are factors affecting the results post-operatively as well. Today Liechtenstein hernia repair is the method of choice in an open repair and one of the most common procedures practiced in general surgery departments . In order to reduce the frequency of complications and complaints post-operatively few methods were developed for a better mesh fixation using external stitches or glue. Also by a built-in mesh features . A self-fixating mesh is a new built-in feature that introduces a surface saturated with small micro grips that would eliminate the need for traditional tack fixation or glue  that would theoretically lead to post-operative complications. In addition to the open access, there is also the laparoscopic access, based on either total extra peritoneal (TEP) or transabdominal pre-peritonea techniques (TAPP) . The purpose of the study is to determine retrospectively the consequences of the use of self-fixating mesh by evaluating the post-operative pain, complications, and recurrences, returning to daily activities and the quality of life during one month, three months and 6 months after the operation. The study included 248 patients who were operated between 2010- 2012, at the Assuta Hospital by a single surgeon. All had undergone an open inguinal hernia repair with the Lichtenstein tension-free approach, using a self-fixating mesh. All patients included in the study were males, over 18 years old, with no history of recurrent hernia on the same side. We used the Parietex Progrip™ self-fixating mesh from Covidian Company. It offers an immediate fixation of the entire mesh and even distribution of the tension. The resorbable polylactic acid (PLA) micro hooks enable positioning and placing the mesh without the use of additional fixation. The mesh has light weight (38gr/m2), formed with big porous (1.1x1.7mm sized), and it is composed by two monofilament components: polyester (PET) and poly-lactic acid. A horizontal or oblique incision was performed, 5cm long, on the fold of the groin. Then an external and large incision on the external oblique muscle was performed parallel to the external opening of the inguinal canal, connecting the external ring with the internal ring. The Inguinal ligament and the conjoint tendon were exposed widely in order to increase the contact area between the mesh and the floor of the inguinal canal. In cases where there was a direct inguinal hernia the sac was not opened, and in cases with an indirect inguinal hernia the sac was opened, contents were pushed back intraabdominally, ligated and resected. In all the surgeries we made a special attention to preserve the ilio-hypogastric nerve, ilio inguinal nerve and the genital branch of the genito-femoral nerve. The attachment of the mesh to the surrounding tissues via the micro-hooks is immediate (picture 4), in some of the cases we secured the mesh to the pubis with a single absorbable stich, this step can help fixate the mesh in position and prevent it from moving because of it's weakening with the time. After the fixation of the mesh, the parallel incision of the external oblique muscle was closed over the mesh. Our study was performed when all the patients completed two years after surgery. The patients were asked about their medical condition, went through a medical evaluation of their medical background, their relevant surgical history and prescribed medicines. We used the NRS index to subjectively measure the intensity of the post-surgical chronic pain. With a scale from 0 to 10, 0 standing for no pain at all, 1-3 interpreted as light pain, 4-6 moderate pain, 7-8 intense pain and 10 as intolerable pain. The NRS index was used in 1, 3 and 6 months after surgery. Chronic pain was defined as a pain rated with a NRS higher than 3 for more than 3 months, according to the international association of study of pain. At the time the study was performed all patients were two years after surgery and all of them were interrogated about pain rate and other complains during the analyzed time periods. We collected data regarding recurrence rate of the hernia as we considered also the most common complications after inguinal hernia repair such as infection of the surgical wound, hematomas, seromas and nerve injuryincluding any related symptoms and signs. Intensity of the pain was measured during different time periods (one, three and six months after surgery), these changes were analyzed using paired tests- Wilcoxon Signed Ranks Test and/or paired t-test, and/or Friedman Test, and/or Mann-Whitney U according to every case. When crossing the rate of the outcomes indices in this study, with the one reported on the literature, we compared them with the Fisher exact test. The significance was determined as p<0.05. The average age of the patients in our study was 52.41 (12.75 +/-) with a range from 20 to 79 years. In the past medical history there were nine patients (6.1%) with morbid obesity, twenty four (16.2%) with hypertension, ten (6.8%) have diabetes mellitus, five (3.4%) have ischemic heart disease, four (2.7%) were asthmatics, and six (4.1%) have chronic bronchitis (table 2). We noticed that 26.4% of the operated patients smoked, 1.4% was alcoholics, and 72.3% did not had any drinking or smoking habits. Eighteen (12.2%) of the patients had abdominal wall surgeries performed in their past, and two patients were under steroids or autoimmune treatments. The average rate for pain intensity one month after surgery was 3.16 (+/- 2.3), 1.14 (+/- 1.6) after three months and 0.43 (+/- 1.2) after six months. It is notable that in general the intensity of the pain overall was low. We also noticed that pain intensity was higher over the first month after surgery, but it was also clear that the intensity decreased over time (see chart 1). A difference in pain intensity was statistically significant (p<0.0001). Four patients (2.7%) reported an intensity grade of 3 on the NRS scale six months after surgery, six patients (4%) reported intense pain or discomfort two years after surgery, and with the rest of the patients the average reported rate of intensity was lower than grade 3 in the NRS scale. Regarding hernia recurrence, there were two patients (0.8%) who had hernia recurrence and both of them were re-operated. Four patients reported secretions from the surgical wound, and one patient presented with post-surgical fever that subsided after few days with no other complains. Six of them complained about paresthesia on the surgical scar, one reported a sensitive mass in the surgical area, three reported slight inflammation of the surgical area, two suffered from testicular pain, two reported discomfort in the surgical area, and only four patients (2.7%) reported persistent pain after six months with an intensity of grade 2 on the NRS scale. The difference between the number of symptoms reported and the actual number of patients is due to the fact that there were patients who reported more than one symptom. We also noticed (chart 2) that the patients that reported chronic pain had suffered from a more intense pain immediately after the operation than patients who did not suffer from chronic pain during the whole study. This difference was statistically significant (p<0.0001). Analyzing the data regarding the pain has showed that hypertensive patients reported more intense pain as with normotensive patients during evaluated time lapses (chart 3). This difference was statistically significant (p=0.0003). Lichtenstein tension free repair using a mesh has led to a significant decrease in the percentage of hernia recurrence in comparison with other techniques (were mesh wasn't used), which made it the most popular technique for inguinal hernia repair over the last decade . The incidence of hernia recurrence with primary repair (no mesh) techniques is higher, but a lot of studies showed that the Lichtenstein technique has reduced the possibility of hernia recurrence by 50 to 75%. Remarking that the hernia recurrence with the use of mesh is 1.4% (1 to 3%) [11-15]. In our study it was evident that with the use of the Progrip self-fixating mesh two of the operated patients (0.8%) presented with hernia recurrence. Knowing the incidence reported in the literature there is no real advantage when using a self-fixating mesh in contrast to non-self-fixating mesh in this aspect. We also concluded that in contrast with the fact that the Lichtenstein technique diminished the incidence of hernia recurrence, the method used to fixate the mesh can bring post-operative complications that influence significantly the patient's quality of life and also the time it takes to return to their normal functioning. From all the possible post-operative complications chronic pain, its intensity and chronicity, constitutes a big problem after repair of inguinal hernia (chronic pain is defined as pain which is NRS›3 in intensity for more than three months). According to the literature the incidence of chronic pain after inguinal hernia repair is 6% to 40.47% [5, 16, 17, 18, 19], with no evidence to show significant advantages with the tension-free technique [20-25]. 1. With the use of heavy weighted mesh the incidence of chronic pain is higher than with the use of light weighted mesh . 2. Lack of preservation of the ilio-hypogastric nerve, the ilio-inguinal, and the genital branch of the genitofemoral nerve increase the possibility of presenting chronic pain in the post-operative period . 3. The tissue damage during surgery, this includes the technique used to fixate the mesh to the tissues . Progrip self-fixating mesh is described as a mesh that could diminish the incidence of chronic pain thanks to its light weight, and the fact that the size of its porous can improve the reaction of the surrounding tissues by reducing the inflammatory response to a foreign body. Also the self-adherence to the tissue allows the surgeon to avoid the use of stiches that could cause more traumas to the tissues. The self-fixating mesh was studied and supported by the literature over the last years that reported a low incidence of chronic pain, complications and other post-operative symptoms; they also reported relatively low pain intensity after surgery [2, 5, 6, 7]. We need to point out that further studies are needed to support these conclusions. Our study concluded that the reported rates of pain intensity were relatively low during the analyzed time lapses, and we also showed that the pain intensity decreased with the time. Within the included patients 2.7% rated their pain as NRS›3 in a period of six months after surgery .Only 4% of the operated patients reported pain or discomfort in the surgical area two years after surgery, it is important to emphasize that over all the time lapses the pain intensity reported was low in general, NRS 1-2. We also concluded that the other chronic symptoms also have a minimal impact. The limitations to our study are that we did not evaluate the pain intensity before surgery as compared to the post-operative pain. We did not have a control and randomized study groups; we lack documentation of the nerves manipulation during surgery. The evaluation of the variables was retrospective, and the evaluation of the pain was subjective according to the patient's own opinion. But despite the mentioned limitations the results of our study were clear and statistically significant, and they supported what is written on the literature. In conclusion Covidien's Progrip self-fixating mesh is an "easy to use mesh" for the open repair of inguinal hernia procedure. While taking into consideration the multifactorial nature of the pain, our study showed a decrease in the incidence of chronic pain. It decreases other post-operative complications, while maintaining a low incidence of hernia recurrence, We support the use of self-fixating mesh over the use of other meshes because of its benefits over the patient's general condition and quality of life after surgery, and because of the reduction of the expenses on the medical system it offers by preventing the need of other therapeutic procedures. We encourage more prospective controlled studies to address the issue of chronic in hernia repair. Chastan P. Tension free open inguinal hernia repair using an innovative self gripping semi-resorbable mesh. J Minim Access Surg. 2006; 2(3): 139-143. EU Hernia Trialists Collaboration. Repair of groin hernia with synthetic mesh: meta-analysis of randomized controlled trials. Ann Surg. 2002; 235(3): 322-332. Perkins FM, Kehlet H. Chronic Pain as an Outcome of Surgery: A Review of Predictive Factors. Anesthesiology. 2000; 93(4):1123-1133. Erhan Y, Erhan E, Aydede H, Mercan M, Tok D. Chronic pain after Lichtenstein and preperitoneal (posterior) hernia repair. Can J Surg. 2008; 51(5): 383-387.